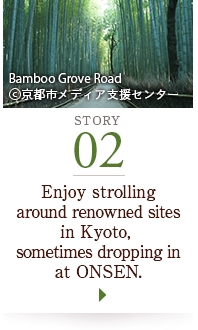 yoto is rated as the most attractive tourist destination city in the world*. It is said that the reasons for the city’s popularity are its traditional culture and art, wonderful landscapes, the joy of having a wide variety of foods, and high-quality hospitality. 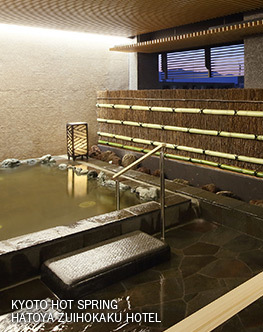 In Kyoto ONSEN(= hot springs), various types of accommodation facilities, including traditional Japanese inns, modern hotels, private home bed & breakfasts, and one-day-trip facilities, are available, and they each offer tourists warm hospitality in their own style. 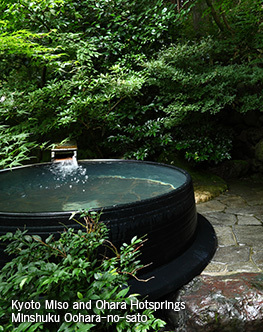 How about selecting ONSEN of hospitality in Kyoto that fits your feeling on each occasion, for example: when you would like to leisurely heal your tiredness or when you would like to take a breather? 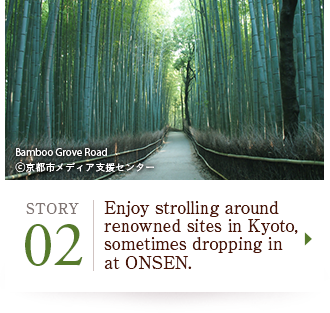 ONSEN will surely add a touch of spice to your travel around Kyoto, and enable you to fully enjoy it. * Cited from the World’s Best Cities in 2014 and 2015 of Travel + Leisure, a leading U.S. travel magazine. 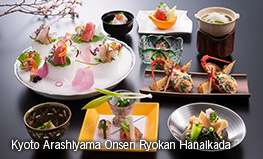 Traditional Japanese inns are filled with miyabi of Japanese culture, as seen in Japanese architecture with the warmth of wood, gardens representing the beauty of natural scenery, the relaxed atmosphere of Japanese-style tatami rooms, and delicious dishes made with seasonal ingredients. 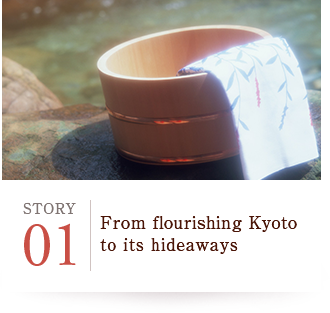 In Kyoto as an origin of Japanese culture, ONSEN of Japanese inns also showcase their own style of hospitality. 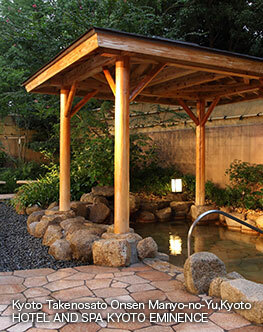 A feature of ONSEN of Japanese inns is open-air baths in good taste. While bathing in ONSEN, you can enjoy the beauty of cherry blossoms or colored autumn leaves that make us feel the dew of life, pleasant breezes blowing through, the colors emitted by the rising and setting sun, and twinkling stars in the evening sky. 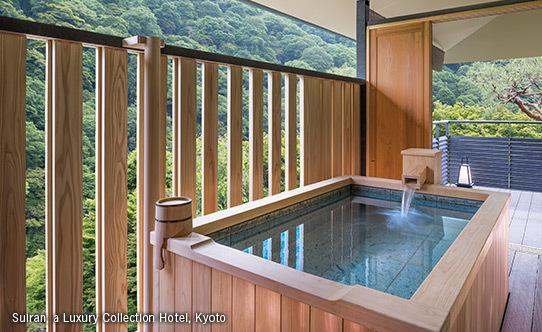 Views from ONSEN, which change as the seasons change and as time goes by, will make you forget the time for a while. 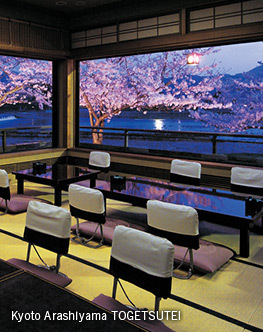 The joy of Japanese inns awaits you after bathing too. The aroma of tatami you experience when lying down after changing into yukata, specialty dishes filled with warm hospitality, etc., will satisfy all your senses. 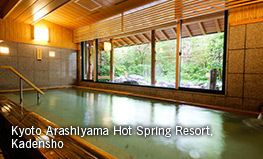 ONSEN of hotels equipped with state-of-the art facilities pursue comfortable ways of enjoying ONSEN. 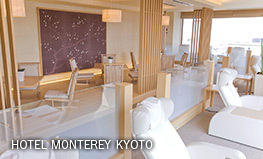 Each hotel provides tourists with its own varieties of facilities and services, such as a large public bath on the top of the hotel offering a panoramic view of the city, jet baths, a sauna, bedrock bathing, and spa programs. After bathing, you can also spend a happy time as you like, with hospitality unique to hotels, enjoying a drink at the bar or chatting in your room. 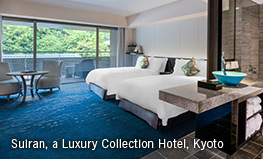 Additionally, hotel design making the best use of Japanese taste and thorough service are also attracting tourists. 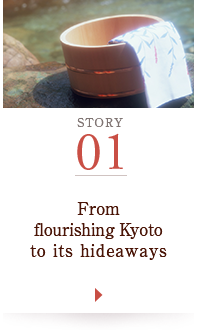 Guesthouses on homelike hospitality give tourists thorough and thoughtful treatment particular to Kyoto in a relaxing and cozy atmosphere, with open-air baths in quiet nature, dishes made with local seasonal ingredients, and nostalgic kotatsu in the winter. 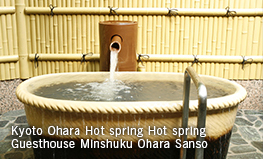 ONSEN of guesthouses will relax you as tourists mentally with their friendliness and warmth. 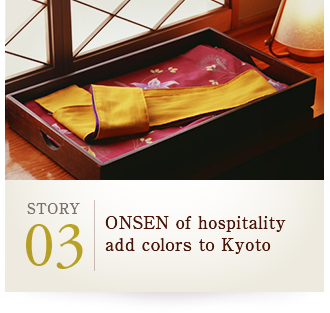 ONSEN of hospitality in Kyoto add new colors to tourism in Kyoto woven with a wide variety of joy and warm treatment. 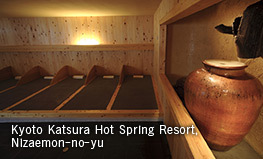 Why not try colorful and unique ONSEN to more fully enjoy your travel around Kyoto?